Mr. 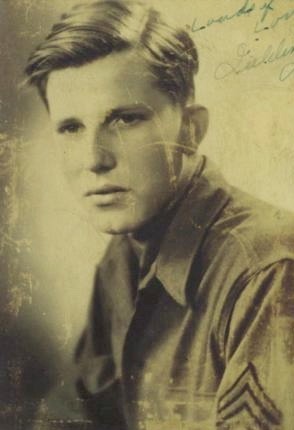 Fielding Tucker is veteran of world war 2. He served with the 143rd Infantry Regiment, 36th Division. Now retired he regularly produces 'FDT's Newsletter' for his family and friends. The following is an excerpt from the October/November 1998 edition. Saint-Leonard, a name that has continually come to mind for the last five decades. The name is of a quaint little village situated in the foothills of the Vosges in Eastern France. It was not long after our encounter near this village that I made myself a promise, one not to be forgotten but to be kept in the many years to follow. The incident bringing about a promise, I have lived with since that day, November 20, 1944. A promise made out of both fear and anger, maybe some day if it be God's will, I would return. Much has happened during the nearly fifty years since that encounter. A marriage and a job barely producing enough food, clothing and housing for a family of ten, those everyday worries of raising such a large family. Yet, in the back of my mind, Saint-Leonard somehow survived. God granted my wish, a promise made to keep, 47 years later. For November 20, 1991, I found myself once again walking that same path of November 20, 1944. I found Saint-Leonard to be a taste of both, the "bitter" and the "sweet". Not only was I fortunate in returning in 1991, but again on November 20, 1994, my prayerful wish was answered in twofold. It was at Saint-Leonard during the early morning hours of November 20, 1944, when we became engaged in a firefight with a German holding force. We had been sent there to check the German strength. Two close friends, Archie Taylor and Charly Holm, lost their lives on that very cold morning. Others on the patrol were wounded. Charly Holm was the cheerful type of fellow and a good Squad leader highly interested in German weapons and radios. He would be seen tinkering around with a German prize. Charly was a souvenir seeker at heart. I think his fancy for radios was a carry over from having lived with an uncle, who operated a radio shop. Holm once mentioned he was raised by an uncle. Holm also told us that his family never saw him in uniform. What I remember about Charly was his big feet. He pulled a size 13 boot. Archie Taylor and I went through basic training together at Fort McClellan, Alabama. He, Daniel Tubb, Andrew Tessa, Tadlock and myself, we returned together throughout most of the Italian campaign. Tadlock, he was wounded near Velletri while in the same foxhole with Daniel Tubb and myself. Tadlock never returned to the company. Tessa died while on patrol during the Bulge. Taylor, being a Mississippi farm boy that he was, often kept us entertained talking about life down on the farm, about his girl friend he had to leave behind. Taylor's occupation delayed his induction in the service for a year or so. He finally had to leave the farm and take up arms. Taylor was truly an attention getter, well liked by his fellow men. Most details prior to the beginning of the patrol are somewhat hazy. Many years have passed since that ill fated morning, but what happened on an during that patrol, I remember so well. Our division had been committed to the lines for nearly four months before being relieved on November 19th, the day before being sent to the Saint-Leonard area, November 20th. We had relieved the 103rd Division. The patrol was made up of Third Platoon members. There were times when there would be volunteers on a patrol, likely a non-com or one who is seeking a souvenir. It is thought that either, Charly Holm or Archie Taylor had volunteered for this mission. There were twelve on the patrol, including a radio operator joining us from communications. Holm and Taylor were in the lead of our group. I brought up the rear following the radio operator. Our mission: to cross the Meurthe at St. Leonard and seek the strenght of the enemy, bring back any prisoners if possible. Having been in the lines for so long and without relief, most were weary and tired with little or no sleep. Things seemed relatively quiet up until now. None of the group sensed any danger that may lay ahead. We were anxious to complete our mission and return for some much needed rest before the outfit would pull out again. November 20, 1944 was a very cold morning with a heavy snowfall. We would be travelling light with no packs this time. Only our helmets, weapons, and canteen. After drawing our ammunition, filling our canteens, the detail was assembled and about to embark on a seemingly simple mission. Our group stood around in a path that lead to the edge of the forest. We were trying to keep warm waiting for orders to move out. I still remember looking up at the pine branches weighted down by ice, bending down to the ground. Taylor, he was doing his act in keeping us entertained as we moved about to keep warm. He was doing his "down on the farm" Billy Goat act, even butting a comrade who tried to wave him off. Taylor was our morale booster, especially at times like this. Remembering exactly that exact route we followed before crossing the Meurthe would be impossible, but I do rembember how the terrain looked, how we followed a railroad track at the edge of the forest, then a lone building where we took shelter before leaving and following the tree line, where we crossed over a small canal on a narrow foot bridge. After what seemed hours, but were only minutes our patrol began moving out, following the narrow path, winding down to the edge of the forest. Like other patrols that I was part of this one was more like a group of friends taking a walk. We were talking, laughing, and some were even smoking. We failed in keeping the standard distance between men and were in groups of two's and three's. Remaining with the tree line, we followed the railroad tracks, before coming to a building that reminded me of a mechanics shop. Remaining here a short period we continued on leaving the tree line and tracks. We crossed over a meadow, coming to a small stream with a narrow foot walk just outside the village. We picked up the normal interval and began forming into single file. As in most villages civilians would be out, this one seemed deserted. Most of the buildings we passed were burned. In a situation such as this you could very well expect the Germans. We approached the Meurthe river in the vicinity of a building with a tall brick chimney. Here we found the water too deep for crossing. We followed the bank to to where a bridge had been blown and that would be our crossing point. Large pieces of concrete lay in the shallow water with a distance between some pieces more than others and making it difficult to cross without stepping into the water. Chester Taylor, (no kin to Archie) carried a BAR. This gun, a heavy piece, made it difficult for him to keep his balance. It was no surprise in seeing Charly shoulder the weapon and carry it to the other side. Charly made it over and was up on the bank. We were still below and looking for a way up when I noticed him standing above with that silly grin on his face and holding his canteen, he had just taken a drink. His boots were dripping wet from crossing over the rocks. Although it was freezing, Charly showed no signs of being cold. Shortly after crossing the Meurthe we approached a railroad yard. Near there was a factory with windows, maybe a machine shop, it had been gutted by fire. We came to a large crane that spanned the tracks. I remember this section of the tracks more so than the others, because of the ankle deep cinder rocks, and also the huge crane. Along here is where we began moving out into an open field, to follow a direction that paralleled the village, then turning to to the hills. Slowly making our way just a short distance from the hills, we began following a border line made up of small saplings and dense brush, separating the fields but giving us no cover and but little concealment. I remember a narrow and shallow ditch that might have been a drainage ditch, where Germans began firing their rifles and machine guns, pinning us to the ground with no place to go. Taylor was the first to get hit as he walked by Charly. I am not sure that the radio operator was wounded. The radio was on the ground a short distance from where I lay. I felt as if the Germans had been following our every step as we crossed the field, waiting for the right moment. Charly was kneeling at Taylor's side, using his sweater as a compress trying to stop the bleeding coming from a chest wound, when he was also hit, to fall beside Taylor. We weren't able to move, the Germans kept firing with no let up. Our return fire had little or no effect at this non-visible target on the hill. Whizzing bullets passing, sound like someone popping a whip near your head. Most had fired their limited issue of ammo and were holding empty weapons. Someone speaking on the radio caught my attention. The artillery observer was trying to make a contact. Reaching the receiver, I requested smoke for our cover and H.E. for the Germans. The voice kept telling us to pull back. I repeated my question again and got no response. It was then I knew I wasn't getting through since I could hear the observer and he could not hear me. In all the confusion I had failed to turn the "butterfly switch" on the receiver. I knew absolutely nothing about a radio. The observer must have been on the hill to our rear to have known we were in trouble. I turned the switch and got through, repeating my original request. The first round of smoke landed far beyond us, I guess the range was off. On about the fourth try a round of smoke landed between the Germans and us. My next request for H.E. landed on the hill where the Germans were firing from. I was asked if we needed medics and my reply was 'yes'. We reached Taylor and Charly under cover of the smoke. Taylor was still conscious but bleeding. He was also struck in the thumb on his right hand. Holm was dead as he lay beside Taylor. A bullet had entered his helmet where the chin strap is attached, striking him in the temple. It was not long before the medics reached our position and laid Taylor on a stretcher. Others not as seriously wounded, made it on their own. Charly was left where he fell, later to be classified M.I.A. Taylor was in a lot of pain, the medics had cautioned us about staying in step so as not to jolt the litter. I could not help but notice Taylor's thumb, there was no blood around the wound. We made the return to our lines without incident. Later, I had to conclude that the observer had to be on that hillside to our rear, to be able to see us and our movements. Apparently he could not see from where the Germans were firing. The same morning, Daniel Tubb and a detail tried to recover the body of Charly, but he and his men were turned back by the Germans. It is not sure if this was the same outfit that had fired on us. Three days later word came out Taylor had died from his wounds. For those of us who had been together for so long, this would be a dark day. There was only remaining a few of us now, who began a lasting friendship during those rugged training days at Fort McLellan, Alabama. To see Charly lying in the field and now with Taylor gone, it would leave a big void. Tubb, Taylor and myself, we remained together for a long time. The army did just about everything in "alphabetical order". I would think that we were the oldest "T's" in I Company. Tubb and many of our platoon would become prisoners of the SS in the Ribeauvillé area soon. During my return to Saint-Leonard, November 20, 1991, I stood at the site where our patrol had crossed the Meurthe. A new bridge spans the river now. Those pieces of concrete in the water are gone. I tried hard to visualize Charly standing on the bank looking down with that silly grin on his face, still holding his canteen as water seeped from his boots. On November 21, 1994, for the 50th anniversary of the liberation of Saint-Leonard, I was fortunate again in returning to this quaint little village, to see the river, the railroad yard, and the field where our patrol encountered the Germans on that very cold morning, November 20, 1944. As I walked those same grounds that day, I tried to imagine that Taylor and Holm were just ahead of me. In 1947 Charly Holm was removed from his grave in the field where he fell that day. He was carried to the beautiful Saint-Avold Military Cemetary. Among the many citations and awards, including two Purple Hearts, Charly was posthumously awarded the D.S.C.